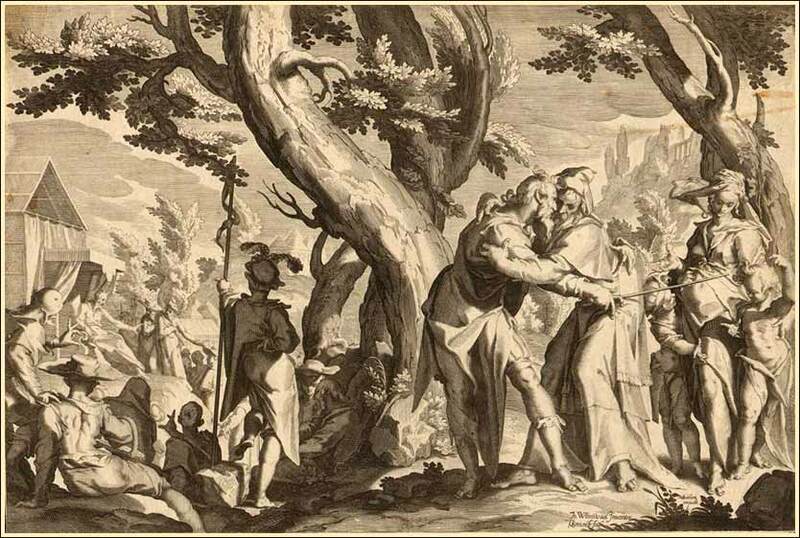 Moses and Jethro, engraving by Wm. Swanenburg ca. 1606. Moses, Jethro and Miriam with her two sons are in the foreground. Moses can also be seen sitting as a judge in a small figure on the left. When I hear the expression "voice of an angel", Kathleen Battle is the first person who comes to my mind. Heard here in St. Peter’s Cathedral singing the Agnus Dei from Mozart's Coronation Mass. 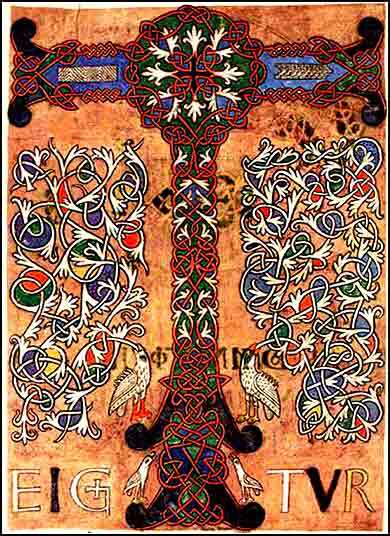 Illuminated "T" from the Sacramentary of Figeac (French, 11th century). Moses' father-in-law said to him, “What you are doing is not good. You and the people with you will certainly wear yourselves out, for the thing is too heavy for you. You are not able to do it alone. Now obey my voice; I will give you advice, and God be with you! You shall represent the people before God and bring their cases to God, and you shall warn them about the statutes and the laws, and make them know the way in which they must walk and what they must do. Moreover, look for able men from all the people, men who fear God, who are trustworthy and hate a bribe, and place such men over the people as chiefs of thousands, of hundreds, of fifties, and of tens. And let them judge the people at all times. Every great matter they shall bring to you, but any small matter they shall decide themselves. So it will be easier for you, and they will bear the burden with you. Moses chose able men out of all Israel and made them heads over the people, chiefs of thousands, of hundreds, of fifties, and of tens. And they judged the people at all times. Any hard case they brought to Moses, but any small matter they decided themselves. Moses is a prophet, perhaps the greatest prophet of Israel, but he is unprepared for the absolute leadership that has been dropped into his lap. We have seen him seek help. He is not an orator — he possibly has a physical speech impediment — and even before he accepted Yahweh's commission, Aaron became his spokesman. Aaron has more and more come to act like a minister, in both senses of the word: a subordinate political official, as well as the high priest of Yahweh. So Moses has much-needed assistance for one aspect of his rulership. We have also just seen Moses delegate another important function of governance, for it was the young, vigorous, and capable Joshua who acted as the Hebrews' general in their first battle, against the Amalekites at Rephidim. But it is, surprisingly, an outsider who first organizes a judicial system. The claims of later kings to be divinely ordained notwithstanding, God has generally seemed impartial to temporal politics; to organize a government, Moses is on his own. His father-in-law, an experienced leader (as the priest of the Midianites), gives him good counsel. The division of the Israelites into thousands, hundred, fifties, and tens will endure. Likely, this hierarchy and terminology was already in place. Jethro strengthened it, and possibly modified it, rather than inventing it. The use of numbers were more descriptive than proscriptive. That is, the Hebrews were organized organically into kinship units that we might call tribes, clans, extended families, and immediate families of approximately the numbers of one thousand, etc. Oddly, recounting that the judicial organization of Israel originated with a non-Hebrew man, rather than a commandment of God through Moses, lends credibility to Exodus as an historically accurate work. For if Exodus were a biased or fictionalized account seeking only to convince readers of God's power, it would never credit the intelligence and experience of a human mind with such a major role, much less the advice of a Midianite.